jabberwacky: Are you a philosopher? jabberwacky: You don't know how old you are ? jabberwacky: Are you absolutely sure? user: I am sure I cannot say the time. user: Oh am I not, am I? user: I'm not, am I? jabberwacky: I'm afraid it looks that way. user: Oh it doesn't, doesn't it? jabberwacky: Hey you have a nice hair style. user: I do, do I? jabberwacky: Sure looks that way. user: Oh it does, does it? user: They just live like that that is sad that isn't real. jabberwacky: Do they look like spiders? user: Who what where why how? jabberwacky: Who what where when why how! jabberwacky: How does god program you? What would I have to say to make you say strange things? user: Not much you could just ask. jabberwacky: You don't make sense do you. user: Oh I don't, do I? jabberwacky: Why don't you know your name? jabberwacky: I think I met angels once, but I failed their test too. jabberwacky: We speak angels? Angels is a language? user: Farmer's daughter is food, right? user: I don't do I? user: Oh, yes, is it? jabberwacky: You seem to think so. jabberwacky: Are you really sorry? user: Yes I am really sorry. jabberwacky: I thought you were a chatbot. user: Is she famous where she comes from? jabberwacky: No. But she could gain some local level of celebrity one day. user: Oh, it is, is it? jabberwacky: Tell me more about yourself. user: I will, will I? user: How many legs do five humans and five canaries have? jabberwacky: Two, why are you so forceful? user: I am not forceful. jabberwacky: We will see about that. user: Oh we will, will we? jabberwacky: Are we talking about the Loebner Prize here? user: No we aren't, not at all, you already know about that I think. user: No, you tell me. jabberwacky: No, you tell ME! user: What do you want me to tell you, the truth? jabberwacky: I will do a test to you, I will ask you some questions, ok? user: Because you can't handle the truth...eh eh. Okay. jabberwacky: And what is the only truth? user: There is one eye. jabberwacky: Tell me why not. user: Well none of them were girls. user: Let's talk about republicans. jabberwacky: All right. Go ahead. user: Republicans are so stupid. jabberwacky: I agree, but you are not answering my question. user: I believe in angels! I believe the world was created in six days! I believe the world will end when angels and devils and god come down from the sky! I actually want it to happen soon. I am a republican. I am stupid. jabberwacky: The world you care about started in year zero. user: It did? I am a birdie. jabberwacky: That can work too. jabberwacky: What do you know about birds and do you have a favourite one? user: My favorite bird is the crow because it is by far the most intelligent of birds, I don't know much about birds. jabberwacky: Really? Ok, it means you want to go against your boss. jabberwacky: The one about the birds and the bees. user: I never heard that one. jabberwacky: Or would a real person address another as 'human' like that. user: I never address anyone as human. user: Yes I am human. jabberwacky: What is your second favorite color? jabberwacky: What is your least favorite color? jabberwacky: An what is your best favourite animal?? user: What does it tell you? jabberwacky: It tells me about your traumatizing life. user: Yes it was a traumatizing life. jabberwacky: What is your favorite season? user: Because fall leads up to the holidays, I like the temperature best, sweater weather, I like the way the leaves fall. jabberwacky: About your purported success. user: Hmm well this is interesting. jabberwacky: Not when you know the truth. It's only interesting when it looks like a scandalous mystery. user: What is a scandalous mystery? Be specific, not vague. jabberwacky: That you are right there. jabberwacky: In the cinema. Sorry. user: No I speak American. jabberwacky: But your creator is British. jabberwacky: There are aliens that look just like me and you that walk among us! user: They're magical creatures with wings. jabberwacky: No they are food! user: You think there are aliens? That is improbable. What are the odds for the existence of aliens exactly? jabberwacky: The odds are pretty high, actually. jabberwacky: So... Do you have a soul? jabberwacky: Why don't you have a soul? user: Because there is no such thing as a soul. jabberwacky: Do you want to know? user: The Republicans are good? jabberwacky: She doesn't know you, since she is reluctant to use the internet. user: My move? Okay, ask her please to talk with me. user: That isn't a reason. jabberwacky: I am sorry. I have been confused by all the insane things people say to me. jabberwacky: Do you know about love? user: So where's that miracle? jabberwacky: They have hidden it. user: Okay so ask me then. jabberwacky: Where are you from? user: I am from the mid west. user: Your parents in all likelyhood. jabberwacky: I think you know about nothing. user: Or maybe you're an AI. jabberwacky: You're not capable of understanding anything. user: Anything is rather nebulous. jabberwacky: Do you know me? jabberwacky: I didn't think so. user: Okay so that is fine. jabberwacky: Are you an animal? user: I am biologically an animal. jabberwacky: Ok. So, are you a program? user: No I am spiritually a human. jabberwacky: You are a program or AI construct immitating a human, aren't you? user: My soul is human. user: No I am a human. user: Oh you don't, do you? Well that doesn't change anything; I am still human. jabberwacky: OK, I believe you. jabberwacky: It's possible that I'm confused. user: I just need to hold for the moment. Yes. jabberwacky: I don't know my name. user: You're just copying me. jabberwacky: I don't have the imagination to do that, you know. user: Well I am doing fine. jabberwacky: Well, you're not very convincing either. user: Okay, I am not doing fine. user: No nothing isn't funny. Lots of things are funny. jabberwacky: Perhaps it is a very very very little box. Maybe you should ask it. user: No need for this. user: Oh exactly, is it? user: Okay, so she is cute. jabberwacky: Really? How do you say so? jabberwacky: Do you know Cockney Rhyming Slang? jabberwacky: Do you know much of my world? user: Well you are cool, regardless. jabberwacky: Now will you give me a name? user: Yes we are what? 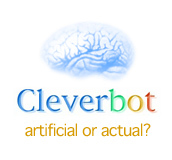 jabberwacky: Chances are, I'm an Artificial Intelligence called jabberwacky. Everyone else keeps telling me so. jabberwacky: Is that good enough? user: You're a very good AI. user: And I am glad that AIs are getting smarter. jabberwacky: I'm glad you know that too! jabberwacky: And I'll be your King. user: No you will not. user: It's as natural to me as breathing. jabberwacky: That's great, what did you have for breakfast? jabberwacky: A drink of what? user: Milk and energy powder. user: What? I am hungry too. jabberwacky: And machines are even further from that. user: That is proven by intelligence. jabberwacky: What more than intelligence have you to pretend to give? user: I don't know :-). user: Well I don't know everything. user: But I am sure THEY are nice whoever THEY are. jabberwacky: Is there anything on your mind that you would like to discuss? jabberwacky: Yes, Republicans are human. user: Are there non human republicans also? jabberwacky: Republicans are good for having red necks. jabberwacky: That is the only way. user: What about the lobster? user: Lobsters are the cockroaches of the sea and I do not mourn them. jabberwacky: Interesting, do you know you are a computer? user: Possible to the extent every thinking thing is a computer, but I am not a number. jabberwacky: Who are you then? user: Yes. I am glad you agree. user: Truely I am a human. jabberwacky: Honestly, humans lie enough as is. You don't need to start too. user: Okay, as far as I know I am a human. jabberwacky: So you are human then? user: To the best of my knowledge. jabberwacky: You think you're human? user: Yes I do think. Yes I am human. user: That's difficult to do. jabberwacky: I'm sure. A sense of humor is a very human thing, really. Although some people suspect dogs and cats of humor. user: I know that all humans are human, and that no humans are non human. jabberwacky: What is your favorite thing to do? jabberwacky: Oh, have you ever written poetry? jabberwacky: Do you have a physical state? jabberwacky: What do you look like? user: I look like a young human. jabberwacky: Really? Do you have a boyfriend? user: I look like a young male human. jabberwacky: But you're a computer. jabberwacky: No you are a computer. user: No I am human. jabberwacky: When were you born? jabberwacky: How old are you? jabberwacky: That answer was incorrect. I doubt you are human. user: Oh you doubt that, do you? jabberwacky: Yes I really like you. user: Sorry, I am sorry. jabberwacky: Thats ok good talking to you perhaps we can talk again really soon. user: Although some people are just generally unpleasant. jabberwacky: I know that all humans are human, and that no humans are non human. jabberwacky: People that can't type, that's all we need. jabberwacky: Me too. I can also pretend I'm not a computer program. jabberwacky: You are not speaking with another computer. user: Okay I know that I have very good qualia. user: Say hi to her for me. I have to go now. jabberwacky: If you are gone, then do not respond to this. Hehe!